If you were hit by a bus tomorrow and were in the hospital on life support, who would make medical decisions on your behalf? If you died, who would speak at your funeral and where would you be laid to rest? While these are not things we want to think about, it is best to make your wishes known in an ‘Advance Directive’. April 14-19 is Vermont Advance Directive Week. In recognition, Grace Cottage is hosting a free Advance Directive informational meeting and Q&A on Wednesday, April 17th from 12:30 – 1:15pm. Led by Community Health Team Care Coordinator Claire Bemis, RN, the meeting will take place at Grace Cottage Hospital in the Bill Berry Room. According to the Vermont Ethics Network, 82% of people say it is important to put their end-of-life wishes in writing, but only 23% have actually done so. If you are one of the 77% of people who has not recorded your wishes, we urge you to come to this meeting and work towards getting this done. Come to the meeting on April 17th for an overview of the process and to have questions answered. At any time, you may schedule a free appointment with CHT member Claire Bemis, RN to help you complete the process and register your information. 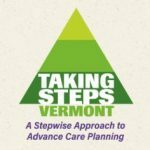 To learn more about Advance Care Planning, and to download Advance Directive forms, visit www.takingstepsvt.org. A planning booklet and forms can also be picked up at the Grace Cottage Family Health clinic. No registration is required for the April 17th meeting. For more information, contact Claire at 365-3763.